1) You hypocrite: you were just FINE with eight years of hysterical Bush derangement syndrome, in which George Bush was equated with Adolf Hitler about a billion times. You leftwing slimebags were all over yourselves comparing George Bush to Adolf Hitler. But now all of a sudden it’s just inconvenient for you to recognize that “Nazi” stood for “National Socialist German Workers Party.” Now you progressive liberal socialists don’t want to wear the shoe that should have been on your own damn foot all along. Your self-righteous indignation only works in one direction, doesn’t it? 2) You seriously should quit being ignorant and learn something, such as “FDR’s policies prolonged Depression by 7 years, UCLA economists calculate” (and see this CNN Money article as well, which links to one of Cole and Ohanian’s papers). If you read The Forgotten Man you’d have a very different view of FDR. 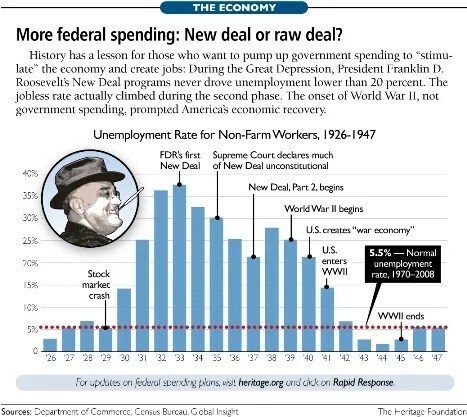 If you read New Deal or Raw Deal you’d have a very different view of the New Deal. Which pretty much puts the kibosh on the myth that FDR got us out of anything. What allowed us to get out of the depression was World War II. If we’d counted on FDR’s policies, we’d probably STILL be in the Great Depression. But you have your propaganda and your ideology. What else do you need? You might want your government to pay people to dig a hole, then pay other people to fill it back up again. With the new modern method of cutting a giant hole in the road, doing a crappy job repaving it, and then having to fix potholes over and over forever after. But that doesn’t mean the increasingly large majority of Americans who are turning against Obama want such stupidity. Not that Obama really gave us any shovel ready jobs to begin with. For what it’s worth, the Obama White House is actually acknowledging that Obama will leave unemployment higher than it was when he took office. Senator Bayh understands that the Obama administration has sacrificed all credibility regarding its utterly failed stimulus. And according to a New York Times/CBS poll, a whopping 94% of the American people agree with Bayh. Only 6% of Americans believe Obama’s massive porkulus has created jobs a full year after going into effect. To the extent that Obama’s porkulus actually has created any jobs, it has created far too few and at far too high a cost to taxpayers’ children’s children’s children’s children. As I demonstrated, the White House’s own numbers only claim 595,263 jobs at a cost of $272 billion. Which comes out to an astronomical $456,941 per job. So when it comes to your wrongheaded thesis that the New Deal got us out of the Great Depression, that’s what makes me think “that it isn’t going to this time” when it comes to Obama’s New Deal Part Deux. It’s decades past time that we shoved a wooden stake into the heart of liberal myths once and for all. Another liberal myth that needs exploding is the far newer lie about who was to blame for imploding our economy in 2008.